VIENNA/FRANKFURT (Reuters) - The fate of Austria's nationalized lender Hypo Alpe Adria could be a harsh reality check for banks and investors across Europe. If the Austrian government decides to let a bank with a balance sheet worth nearly 9 percent of economic output fail, wiping out creditors including Bavaria's state bank BayernLB, it could be the biggest jolt to the euro zone since Cyprus hit savers in 2013 to avoid collapse. Under public pressure to deal with Hypo after four years of foot-dragging, Austria's ruling centrist coalition has not ruled out letting Hypo go bust but currently favors creating a state-run "bad bank" to take on its soured loans, leases and property, hoovering up as much as 19 billion euros in assets. Freed from strict capital standards that banks must meet, the unit could wind down the assets over time, relieving pressure on rump Hypo to keep its capital ratios up. Still, a "bad bank" could boost Austrian debt to around 80 percent of economic output and potentially hurt its credit rating. Ratings agency Moody's has already cut its ratings on Hypo and some debt of other banks and downgraded Hypo's home province of Carinthia, citing uncertainty about Vienna's commitment to avoid seeing both go down. "It is hard not to be concerned because there have been so many conflicting statements coming out," said Satish Pulle, lead portfolio manager at ECM asset management in London. "While it could be a negotiating tactic to get BayernLB to shoulder more of the losses, the fact that the government guarantee has been thrown into question by Moody's is a source of concern." Pulle added that Hypo could be "a wake-up call" for the market and that letting the bank go to the wall would remind investors that banks' senior debt, once considered untouchable, was now at risk in the event of a failure. Austria's central bank and financial watchdog have said letting Hypo go bust would bankrupt its home state Carinthia by triggering 12.5 billion euros in debt guarantees. It could also sweep in other banks and damage Austria's market reputation. But a Gallup poll at the weekend showed 63 percent of Austrians favor pulling the plug on a bank that has so far cost them 4.8 billion euros in aid after its breakneck expansion in Austria and the Balkans in the run-up to the financial crisis. The Austrian government is expected to make a decision on Hypo's fate next month. Hypo looms large as Fitch rules on Friday whether Austria keeps its top debt rating. Moody's gives its verdict on Austria's sovereign rating next week. Founded in 1896 as the Province of Carinthia Mortgage Bank, Hypo was a sleepy lender far from the hubbub of international finance until Joerg Haider, the far-right Freedom Party leader who governed the province, built it into a regional powerhouse. Taking advantage of Carinthian state guarantees that cut Hypo's borrowing costs, the bank pumped up its balance sheet from 5.4 billion euros in 2000 to 43.3 billion in 2008. The expansion continued even after BayernLB took over. Hypo lent money to an airline that went broke and helped Haider's government finance a grand lakefront stage in Klagenfurt the capital. It also expanded into the Balkans. People close to Hypo said a mix of political influence, criminal activity and incompetence drove its expansion. Former Chief Executive Wolfgang Kulterer and other senior managers have already been convicted of misusing bank funds by financing the ill-fated airline, lending money to investors for a share sale and covering up swap losses. They also face other criminal charges. Kulterer confessed to covering up the swap losses but had pleaded not guilty in the other two cases. "Coming to grips with the past shows that in particular former members of the bank's boards have done serious damage through their behavior. 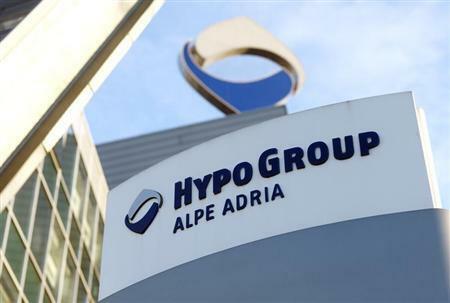 The initial convictions show that the systemic failure at Hypo Alpe Adria was not least triggered by and supported from the top," a Hypo spokesman said. Kulterer declined through his lawyer to comment. Management blunders also help to explain how Hypo ended up with close to 1.7 billion euros in writedowns and loan-losses that threatened its survival at the time of the rescue in 2009, a banker close to Hypo said. It had yachts as collateral but had no idea which loans they were backing. It financed a Belgrade office building used as security, then discovered when the loan went bad that the developer still had rights to all its access roads, making the property inaccessible, the banker said. Those who want to pull the plug on Hypo, mainly opposition politicians, argue this could ease the burden on taxpayers by sucking in Hypo bondholders and other creditors including former owner BayernLB, that still has 2.3 billion euros stranded at Hypo and wants its money back. BayernLB, which has already taken a 3.7 billion euro hit from its Hypo adventure and faces more pain, still has a say in strategic decisions at its former subsidiary. The Austrian government will need to consult with it before deciding Hypo's fate. BayernLB declined to comment for this story. The painful decision now looming over Hypo has resonances with its recent history. Back in 2009, the German bank's reluctance to put more money into Hypo in 2009 forced the Austrians to nationalize it over the weekend of December 14 2009, three people involved in the talks said. The FMA watchdog had given the owners until Monday morning to get the bank back on its feet or else it would be shut down. The Austrians wanted German help if they were to convince the market that Hypo was a viable bank. At one point, then Austrian Finance Minister Josef Proell, tanned from a five-day holiday in Mauritius, cornered Bavarian counterpart Georg Fahrenschon in the ministry's canteen to urge the Bavarians to leave more funds at Hypo. "Georg," he said between bites of a debrecener sausage, "I need a billion to sell this externally," one person recalled. "C'mon Josef, that makes no sense," the Bavarian replied, playing hardball. Eventually, the realization that Carinthia could not honor its guarantees - then worth 19 billion euros - on Hypo debt sealed the bank's nationalization. "It was like playing poker with one side's cards turned face up," one official recalled.